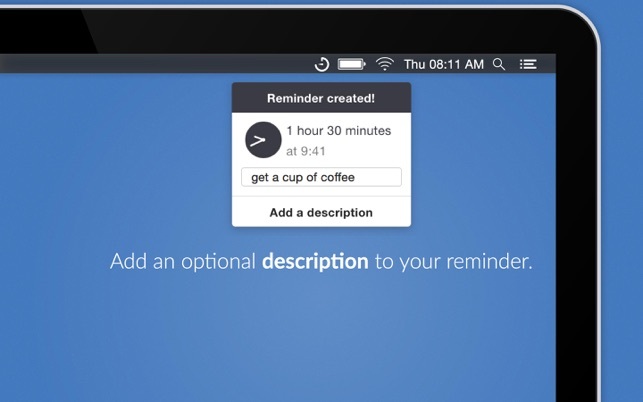 This app is well-designed and does exactly what I imagine a lot of people need, which is to very quickly set tmiers and reminders for even the smallest tasks that come up impromptu, especially if you’re sitting in front of the computer working most of the time. The quick drag-to-set function is creative and efficient, syncing with Apple Reminders is practical and a plus, and even if all you need is a quick timer you can set and forget about, being able to give it a name which pops up with the alert makes it so much nicer. The one thing I think it’s missing, at least for me, is the ability to leave the timer/reminder progress window open, with the option to make it float on top so that it’s always visible. I know that might seem redundant to some but I for one leave the menu bar hidden for more screen real estate, and being visible at all times so I can keep glancing at it and know how much I have to speed up my task during deadlines is often what I actually need more than just telling me when the time comes. I actually thought this was possible before I purchased because I saw the image of the window and it seemed to be the default for other timer apps I checked out. I still think it’s the best one out there but sadly I may not get as much use out of it. I’m hoping this isn’t a difficult thing to implement and the developers see the merit, but that’s just me. 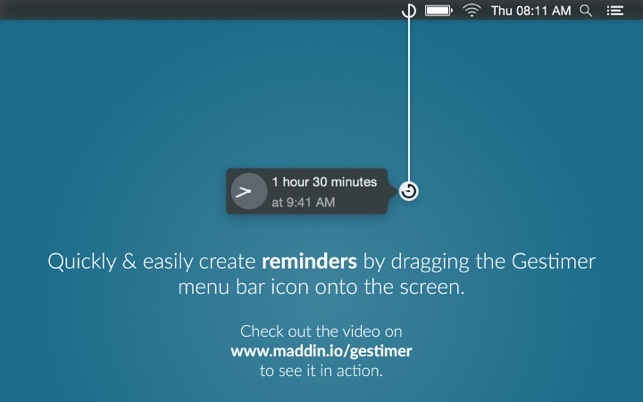 Gestimer makes it quick and easy to set a timer, and it uses notifications to let you know when the time is up. I used notification preferences to turn off the sounds for Gestimer and opted to use an Alert when the time is up. This works great for me because it’s silent, yet the Alert stays on the screen until I acknowledge it, so I can’t miss it. I couldn’t find another app that had a silent alarm except for one that kept crashing. Note that if you want a sound, it does that by default. 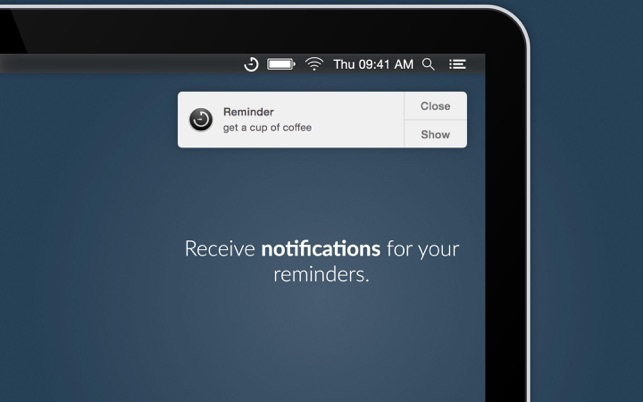 You can also sync it with Reminders which creates a group of reminders for Gestimer. This does let you set reminders further in the future than you can with the drag and drop which goes out about 7 hours. You could also create ones that repeat every day. The only improvement I would like is to be able to tell it to repeat the timer automatically; like when I complete this 20 minute timer, automatically start another 20 minute timer. I don’t leave alot of review, but when something just works and I’ve tried others, I think one should leave a review. It just works, simple, yet has the features I wish it had. 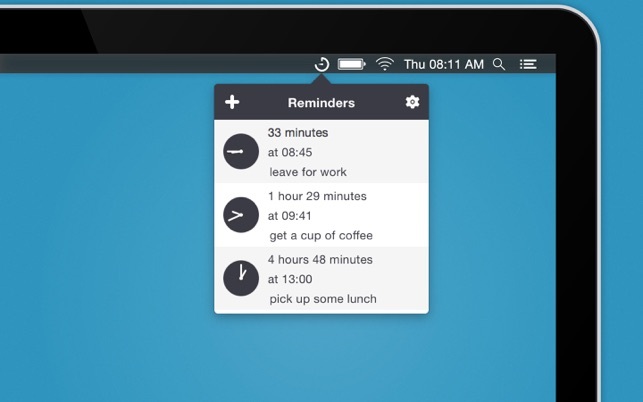 Optional countdown in the menu bar, ability to give a reminder a title, sync reminders and notifications. My only issue is I can’t seem to set a reminder under 10 minutes, I see on the developers very good FAQ page that it’s a comming feature, I guess I’ll wait to be pleasantly surprised. Feature request: Menu icon and countdown turn red when the counter is in action (don’t know if that’s possible, but I have other menu icons that have great colors).